Between the endless rain and my Ragtime schedule, I’ve been a little swamped lately. John got the vegetable patch tilled but it’s filled with standing water, so until things dry out a little bit and I have more time, my springtime gardening has been limited to containers. About a month ago I bought some seed potatoes (three varieties: Kennebunk, Pontiac and Yukon Gold), resolved once again to see if I can find some way to grow these tubers. Regular readers will remember that I’ve tried to grow them for the past several seasons and have been disappointed in the results. 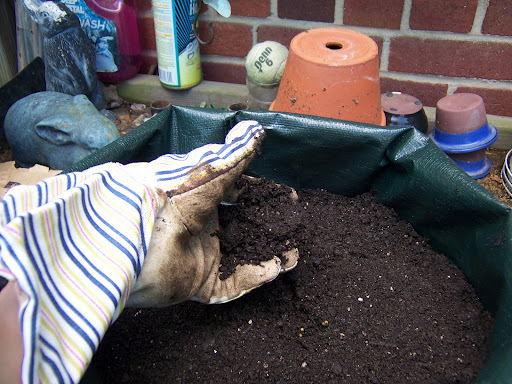 My father-in-law advised me that my soil was probably too heavy and wet, which seems reasonable since some of my taters were actually rotting when I tried to harvest them. But how to remedy this problem? I’d tried hilling the plants with straw, but even that didn’t really work. 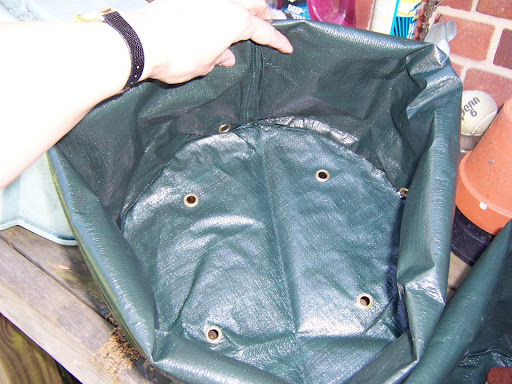 During the holidays I worked part-time for Plow & Hearth in Fairfax, and discovered a potato-planter-bag-thingy that they carried the previous year (now discontinued). 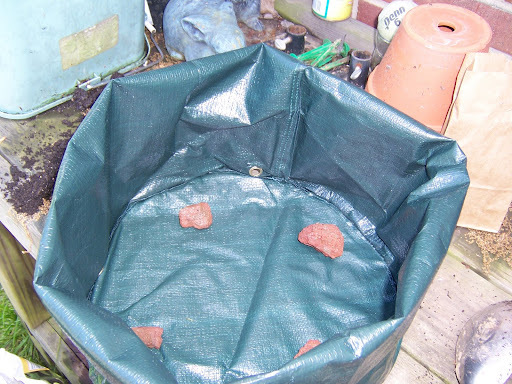 I was intrigued, because if I could grow the potatoes in containers, then I could control the amount of water they got. 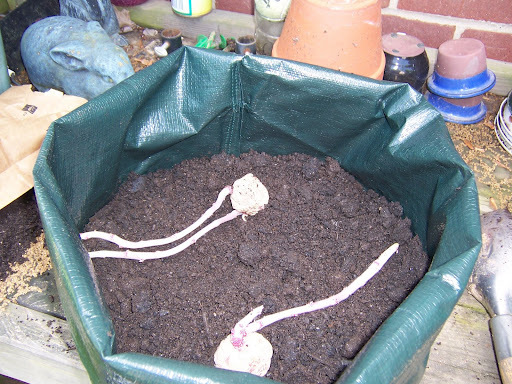 I was able to find a set of the potato bags at another P&H store, had them transferred to the Fairfax store, purchased them and put them away until I was ready to plant. This morning when I looked at my seed potatoes, I realized that I needed to get them into the planters pronto. 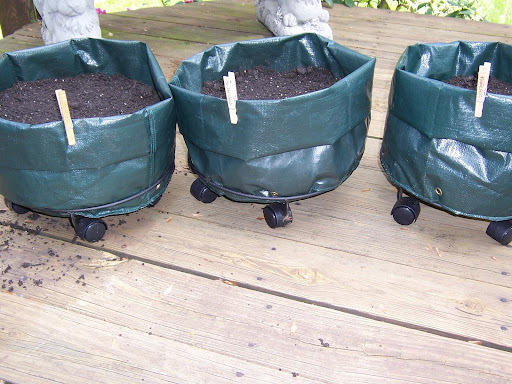 With the soil patted down firmly over the seed potatoes, I then transferred the three bags to rolling plant caddies on the deck. I labeled each planter by writing the name of the potato variety on a clothespin, then clipping it to the side of the bag.